The National Campus for the Archaeology of Israel was inaugurated in 2016, and at the center of which stands the Dan David Archaeology Building, donated by the Dan David Foundation. The Dan David Archaeology Building hosts exhibitions on the latest archaeological discoveries in Israel, research and restoration laboratories and storage facilities for treasures ranging from the Dead Sea Scrolls to rare mosaics, ancient glassware and pottery. A 400,000-year-old set of teeth, discovered in a cave outside of Tel Aviv, has revealed new information about the daily life of prehistoric man, Israeli scientists announced Wednesday. The excavation at Manot Cave was initiated and supported throughout the years by the late Dan David, founder of the ‘Dan David Prize’, and his son Ariel David. The ongoing research is financially supported by the Dan David Foundation. The Dan David Foundation is a charitable organization established in the year 2000 by the entrepreneur and philanthropist Dan David. It supports research, academic excellence and breakthrough advancements in the sciences and the humanities. While the Foundation’s main goal is supporting the Dan David Prize, it supports several other projects, in Israel and in other countries, in fields that were particularly close to the varied personal interests of the founder. These projects focus mainly on archaeological and historical research, conservation, anthropology and paleontology as well as environmental protection and higher education. Grants for research in Biblical Archaeology under the supervision of Prof. Israel Finkelstein, Tel Aviv University. Projects include excavations at Megiddo, the study and interpretation of First Temple epigraphy and the study of the origins and context of Biblical texts. Grants awarded through the School of History at Tel Aviv University to support postdoctoral researchers, graduate students and conferences. Misliya, Israel / Dan David Laboratory Dedicated to The Search and Study of Modern Humans. An ongoing Prehistoric archaeological site on the side of the Carmel Mountain The site is sponsored by the Dan David Foundation. Special Kindergarten for children with behavioral problem A pledge made to Keren Hayesod (United Jewish Appeal) and Prof. Theodore Iancu and Mrs. Daisy Iancu for the creation, in Haifa, of a kindergarten for Jewish and Arab children with behavioral problems, especially autism, supervised by Daisy Iancu. Sponsorship of activities of the Faculty of the Arts, Tel Aviv University, the Cameri Theatre, Tel Aviv and the Israeli Opera, Tel Aviv. Tel Aviv University team, sponsored by The Dan David Foundation, provides unprecedented glimpse into eating and cooking habits of paleolithic man. 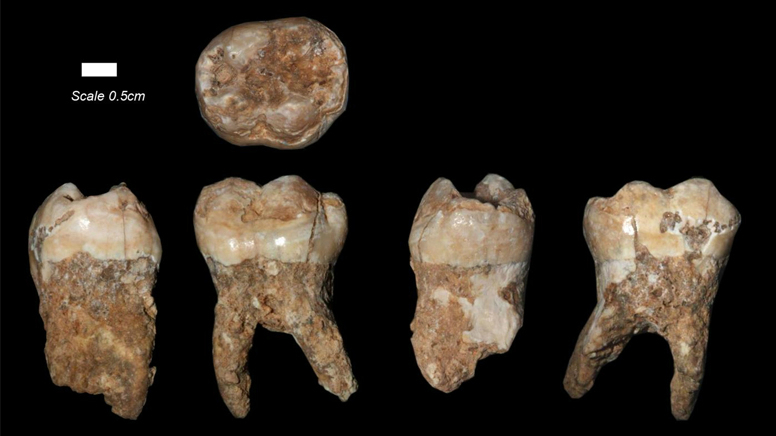 A 400,000-year-old set of teeth, discovered in a cave outside of Tel Aviv, has revealed new information about the daily life of prehistoric man.